We developed a modern, innovative website to showcase Aurora's expertise. 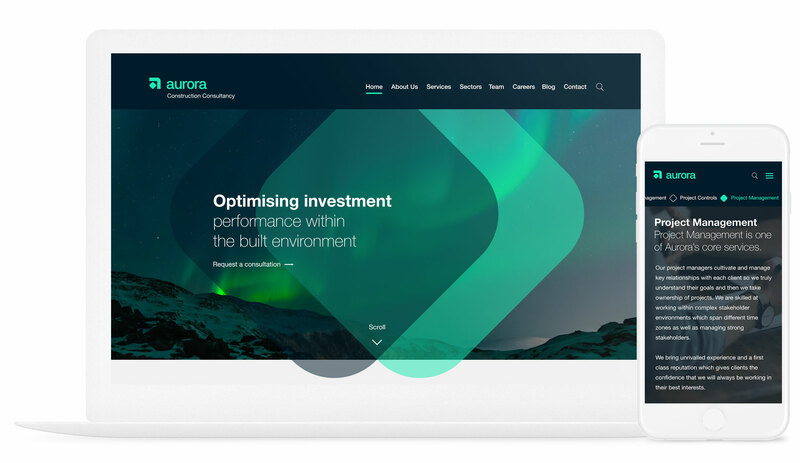 Aurora approached us due to our extensive experience in producing great looking websites for multinational companies, ultimately delivering an excellent user experience. Aurora knew they were in safe hands with us as we use the most modern technology to implement future-proof and fast, scalable websites. Aurora presented us with the challenge of creating a modern and innovative website to showcase the organisations extensive knowledge of construction consultancy services in Scandinavia. Aurora is an independent construction and property consultancy firm working across all sectors of the built environment. They provide their clients with greater transparency, increased risk reduction and greater financial and quality controls to drive the best results for their investment. When Aurora approached us they didn’t have a website, yet they were targeting a relatively well trodden sector that was as yet untapped in this region, so needed to stand out from other providers and communicate their values and key messages. We start all our web projects using a workshop format led by our Head of UX Design, Simon Ker, who explains that during the workshop we “discussed target users, competitor positions within the sector and the desired user experience.” Our UX designers then develop user personas and user journey maps to best suit the target demographic. Working closely with the client we created a strategy that would enable key user journeys and conversions to be reached in the most efficient way. Once finished we ensured that the client had sufficient training in order to keep their website up to date. The client wanted the Aurora theme to strongly represent their location in the Nordics, so we drew inspiration from the colours of the Aurora Borealis. After researching and studying Scandinavian imagery we came to the conclusion that the website should be smart, minimalist and very stylish. We also took into account, as Simon tells us the “Hygge look, the Danish word associated with cosiness and creating a warm atmosphere”. We pride ourselves in our innovative way of working and make use of the very latest technology. 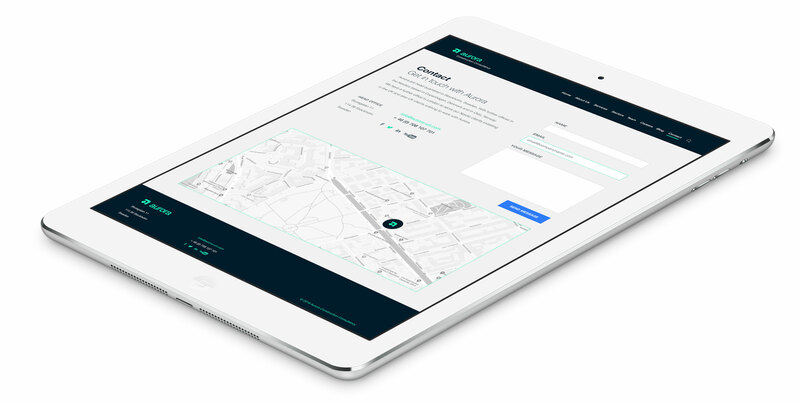 Our UX design and front end experts utilised the very latest tools available, personas were produced using Extensio and capable wireframe prototypes were created using Adobe Experience Designer and Envision. Using Adobe Experience Designer and Extensio we were able to create wireframes that enabled us to design the website so that it would service both the users and business needs. 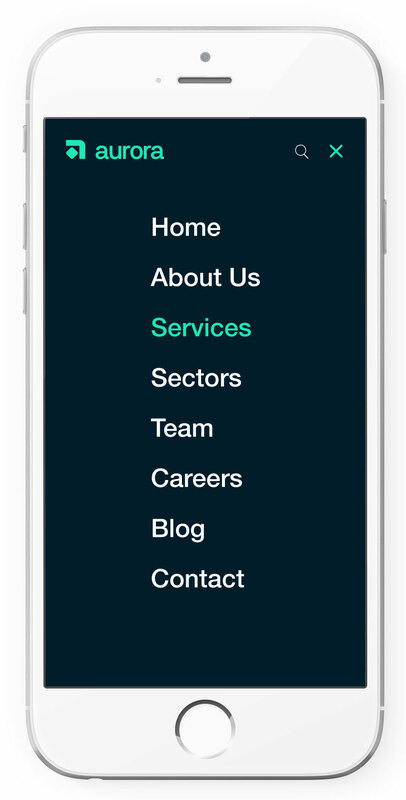 Most importantly, the design allows us and the client to identify measurable metrics around user behaviour. All in all producing an amazing user experience! We aim to please with every piece of our UX design, and client feedback tends to indicate that we do! Aurora’s requirements led us to use some “swanky videos”, including a talking head video of James Pearce, Founder and CEO of Aurora on the home page in an attempt to articulate the personal nature of the service that Aurora provide, therefore legitimising the business and the type of organisation that we’re portraying. Aurora wanted to showcase their experience in a variety of sectors, with specific client testimonials and also profiles of the Aurora team, allowing the user some access to the people behind the organisation.